About the take the lake X-TREME! NOTE: Helmets are required for cycling. Where: Around and over Lake Waccamaw, N.C. NOTE: All events must be completed individually, (so only one person in the kayak and on the bicycle.) Participants may be accompanied, however, so feel free to run, bike, paddle or swim alongside your friend through all or part of each leg. How: Through much training, then 10-16 hours of "I CAN DO THIS! " Why: That's a question you will have 48 long miles to answer. NOTE: In the past, we have had about a dozen individuals compete. Most of us were in our late 40s or early 50s, and we all finished the day with times between 11-15 hours. (See our 2011, 2012 or 2013 competitors With only 13 hours of daylight, the real race is against the sun. Couples? : Each year we have one or two married couples compete in the X-TREME! In 2011 & 12 Jan and Walter Palmer of Whiteville did all four events together, which is why I'm calling their event; "48 Miles of Marital Bonding." In 2012, Greer and Grayson Inman, also of Whiteville competed against each other, which is why I'm calling their event; "Love, Columbus County Style." TEAMS NOTE: We offer Take the Lake X-TREME! also as a team relay event. With such loooooong legs, we tried a modified gang-start format in 2012 and will offer the choice again. That is where the swimmer starts with all the solos at 6 a.m. and then the Runner, Cyclist and Paddler start together at 8 a.m. One benefit is that you should all be done by Noon-1 p.m. Great for out-of-town teams! In 2012, Team Wilson did the gang start and the other two teams went back-to-back. They all said they enjoyed it. In 2013 and 2014, all the teams did the gang start. Date: Held on Labor Day. Starting point: Dale's Restaurant, where Canal Cove Road, Flemmington Drive & Lake Shore Drive all meet, or at the damn, where Waccamaw Shores Road ends. Starts: The 6:30 a.m. start is the only "gang" start for all the solo competitors, who will each start their next PEC upon finishing the swim. Course: About as simple as it can get; just swim across the lake and then keep circling it. Timing: This event will be sanctioned by the USARA, though the courses are not precisely measured. We will keep your times as you check in and out of each leg, though the only time that matters in the race is when you finish the Walk / Run. You will have a bib number written on your arms, but we're not using radio tags, so remember your number and make sure we get your time. First of all, we have imposed a time limit, to keep everyone out of the woods after dark. So be ready for the Walk / Run by 6:30 p.m. Times below are approximate. This leg presents the biggest logistical challenge for us. First, the weather (winds) control which direction we swim. So, if we begin at the dam, we'll have to get you there from Dale's. 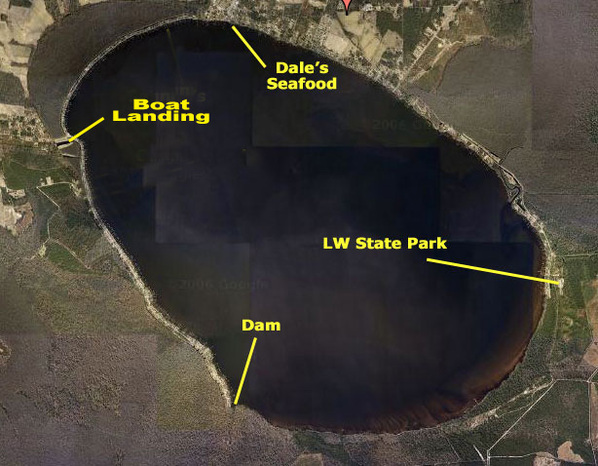 If we start the swim at Dale's, we'll have to transport you back up there from the dam. To make up for this, we'll likely give everybody a block of time (20 minutes?) and "erase" that from your total time. We chose to swim first for a few reasons. Swimming is heavy on the arms, so if you swim, bike, paddle & walk, you will alternate; arms, legs, arms, legs. The swim is "hardest" and we like getting it out of the way first. Cycling first would put us in the park before it opens -- we can't do that. The water is usually calmest early in the morning. But swimming first means we need to have boats at the start point for the 6:30 a.m. start. About the hike - Three miles of this challenge is a walk (or run) along the state park trails. Now, we've been having a small problem in Take the Lake with a few people riding on part of the trail. In TTL-EXTREME!, we expect this to be a big problem, because it is a race, and even for the noncompetitive types, you're racing against the sun. So far, we are relying on participants' honesty, but as the event grows, we may have to rely on, a-hem, something else. We'll start at Dale's. Just like in Take the Lake, you must stay in the no-wake zone (between the poles and the shore.) It is, at times, very tempting to ignore a pole or two. Please don't.